If you had just one chance to achieve your dream, what would you do? In a distant kingdom lived a young musician named Barbad. His one dream was to play before the king in the royal court. But Barbad's way was blocked by Sarkash, a jealous rival who would do anything to stop Barbad from meeting the king. But perhaps the palace wasn t the only place to play before the king, for he loved to walk in his garden. What if Barbad was to hide in a tree for just the right moment to play? Find out if Barbad's dream comes true in this magical tale of patience and determination, which proves that all good things really do come to those who wait. Stunning artwork from award-winning illustrator, Claire Ewart, gently brings this whimsical story to life. 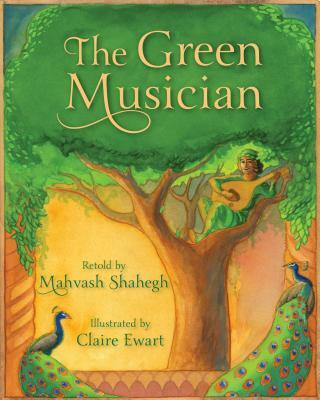 Adapted from a 1,000 year old Persian story by Mahvash Shahegh, the tale of Barbad the musician is originally found in the legendary "Book of Kings" (Shahnameh), which tells the story of the mystical past of ancient Persia. Mahvash Shahegh is an author, educator, librarian, researcher, and translator who taught at John Hopkins University until her recent retirement. She earned a PhD in Persian language and literature in Iran, with her dissertation being on The Trace of Fairies in Persian Stories and Literature. She is the author of a two-volume Persian language book for college students, co-authored with two of her colleagues, titled Learning Persian. She lives in Elkridge, MD. Claire Ewart is an award-winning author and illustrator of children s books. Her most recent book is The Olive Tree by Elsa Marston. In addition to illustrating books by such well-known authors as Paul Fleischman and Tomie dePaola, she has also written and illustrated several of her own books, including One Cold Night, The Giant, and Fossil. Claire has received the Celebrate Literacy Award from the International Reading Association, while her work as an illustrator has been included on Best Book lists from School Library Journal and Parent s Magazine. Her titles have also appeared on the PBS television shows Reading Rainbow and Storytime. Claire lives in Fort Wayne, IN."